How did we go from establishing our civilizations around rivers, deifying water and understanding it as the sacred element of life that it is to the current condition that we exist as when it comes to knowing yet neglecting all the various ways in which we are depleting, polluting, privatizing and squandering our fresh water resources without considering the definitive actions that we must implement to stop this crime against life if we want to ensure Life continues in this world. Water is Human Right, why is it not yet determined as such in the Declaration of Human Rights ? Human beings cannot survive without water – yet over 1 Billion people lack access to potable drinking water which is the first cause of death due to people having to drink from polluted rivers and lakes where all forms of waste and bacteria exist. Not only human beings lack water, all forms of life are currently also not having access to clean waters in rivers and lakes which have become the sewage for industries, entire cities as well as all the chemicals used for agricultural purposes. All of these contaminated waters are used, at the same time, to water crops which means we are essentially eating our toxic waste in our food. This vital liquid is now permeated with all these relationships of abuse – profiteering, control, subjugation, power – that we have formed toward the substance that conforms most of our physical body; our water is contaminated now in the deep ocean where fish are found with bits of plastic and dying from all the bits consumed – the same way that children and people are forced to drink from polluted rivers because water is so expensive or simply non existent in their locality. 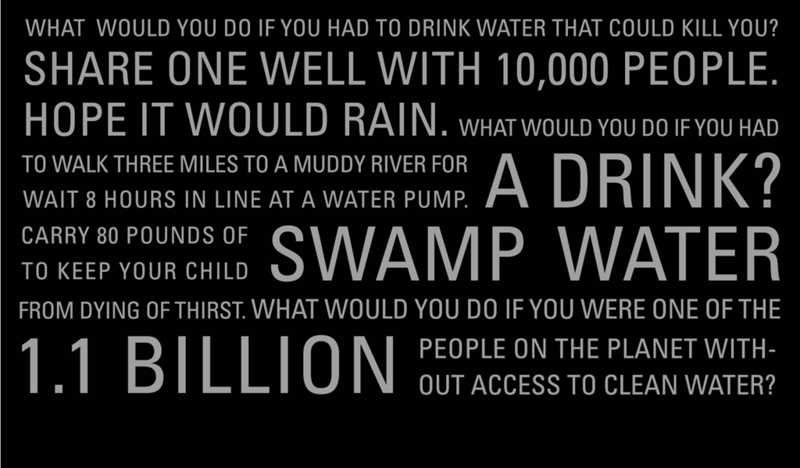 In the world, we pump 30 billion gallons of ground water every single day. We are pumping 50 times more water in the world, which means we are breaking the cycle of percolation in which the water is filtered through all the ground to restore the aquifers in a certain period of time. This isn’t being respected and just as any other energetic resource or animal that we kill to consume before it replenishes its reproductive cycle, we are over consuming water faster than it is extracted and replenished, which shows how we have caved our own pit of drought and scarcity: we haven’t yet learned how to respect the natural cycles of this physical world. The pollution has created the loss of water quality, which means that there are no more minerals and nutrients that would come from the soil that would benefit our physical body– we are tampering our own quality living by denying water to those that need it, by using it indiscriminately and pollute it without any responsibility. Sources: The Economist, the National Geographic Society, USAID studies, The Pacific Institute, Global Development Research Center and the United States Geological Survey. This is all the result of the absolute separation we have created in our reality and world-system “development,” where we have imposed our exigencies to the environment and wanting it to adapt to our lifestyles instead of Ourselves being the ones that adapt to what we have available in this world at a local level. Privatization is the worst crime against humanity that has been going on since the 1990’s when the ability for corporations to own this vital resource comes along with all the ‘free market’ endeavors in our capitalistic system, wherein the right to property is secured for those that have the capital to buy territory, regardless of any law or regulation that implies certain areas are meant to be part of the local patrimony and reserves. The process of claiming the right to the land that is being exploited to obtain water is conducted in violent ways including coup d’états and armed conflicts in order to subjugate people and accept the privatization of water . This was adopted during the Thatcher administration in the UK and from there, it was accepted worldwide as a way to implement Neoliberalism tactics with this vital resources that in the past 25 years has become another profitable and valuable asset just as oil or any other source of Energy. This included tariff free tactics that harm the locality in the worst way since it is an ‘open key’ to poor nation’s resources when it comes to having these major corporations invading a territory, buying it and extracting everything they can and need from it without any local intervention. In 1992 the UN declares that Water is Not a Right but a Commodity. Transnational Corporations have become the owners of water by the aid of the World Trade Organization known as ‘The Quad’ who are the United States, Canada, Japan en the European Union. There’s been demonstrations/protests that have lead to deaths of people through these new colonization processes that entail the use of power and control over resources that generate profit as opposed to the entitlement to water as a human right – we have already reached that time when wars are happening due to water, and where more deaths due to the lack, pollution, rights and use to this liquid are taking place every day. In Mexico, politicians that have been corporate managers have endowed their ‘businesses’ with unlimited access to resources like electricity and water in order for the company to flourish in this country – this is how a single company is considered to rule an entire nation when having privileges that half of the entire Nation’s population lack: access to potable water without having to pay for it – this is what Coca-Cola became during Fox’s administration. In some other countries in Africa, Water is more expensive than coca cola which forces people to drink the ‘unknown ingredients’ beverage instead of having access to water that is being pumped from their own locality but sold to them in plastic bottles. Crops and other goods that require a lot of water for their production are exported according to laws of supply and demand, which means that the water is being used to satisfy other country’s necessities and levels of consumption by using resources that are from a locality far away that usually doesn’t benefit at all from such exporting process other than of course, money which is even then a minimum portion of the final revenue that corporations make wherein, for example, selling water in bottles ensures earning thousands of time more money than the original price paid to get the liquid and bottle it up. This is all built in a slave-master relationship where corporations take a hold of territories, use local workforce to establish the necessary plants to make plastic bottles and bottle water up without informing the people of all the toxicity that these processes imply. Corporations like Nestlé pump 200 gallons of water per minute in order to bottle it up without any regulation which makes it loose of any certainty that the final product, such as bottled water, is in fact safe to consume. Politics and corruption: 87+ corporations are now investing and taking a hold of the water around the planet, including ground water that is being extracted by buying property. All profit making endeavors lead to seeking new territories to ‘conquer’ where corporations can get a hold of the Water in a particular country. Even the process of desalination implies that water will be taken from the common property and returned to the people/public in the form of a product to be sold thousands of times more expensive than if they drank it from their faucet, not to mention that the faucet water is meant to be regularly tested whereas there is no regulation whatsoever in bottled water. There are multiple problems that come from drinking bottled water and it has become the most popular way to drink it thanks to an effective media-marketing campaign that lacks any proper information to reveal the chemical dangers that drinking bottled water implies, besides the profitable business that it is for the corporations that are absolutely unregulated to sell and export water without any pertinent information that may declare it is in fact purified water – because it isn’t. Governmental and Corporate powers have allied to promote water privatization and profitable water business regardless of the known problems that exist when selling water in plastic bottles, but also understanding how this is being accepted and allowed because of lacking information about the actual problems that this causes in health and in the long run causing more expenses in the health sector than any form of profit – yet we don’t seem to grasp the fact that all of this exists due to how we have accepted and allowed ourselves to turn our natural vital resources into commodities. Cities with the largest population don’t have enough water to sustain everyone with a constant availability of the liquid. This is how water is now being brought from states nearby through pipeline systems to supply the ever increasing demand of water. Once that water becomes a corporate endeavor, the possession of water is now a matter of economic importance similar to oil, leading to regulations wherein even accumulating the water from the rain is being prohibited by legal systems mostly fixed to suit corporate interests. This has lead to public uprisings that have already caused deaths while demanding that corporations stay away from what should be a public good and not a matter of commercial disputes and privatization. It is only in Cochabamba, Bolivia – the same place where McDonalds went bankrupt – that it was possible to expel the transnational Bechtel from trying to privatize the water – this is depicted in the movie También La Lluvia (Even the Rain). However in Paraguay, a similar situation is emerging where now territories are being owned for purposes of privatization with the consent of Paraguay’s parliament, which speaks about again the relationship between corporate lobbyists and governmental powers acting in a profitable manner instead of providing and securing people’s well being and access to water for the people and by the people of that particular area/country. Everyone has the right to clean and accessible water, adequate for the health and well-being of the individual and family, and no one shall be deprived of such access or quality of water due to individual economic circumstance. Why is it not added? Huge corporate interests tampering the ability to reclaim Water as a Fundamental Human Right – however, the reality is that we haven’t united ourselves to actually implement this at a Constitutional level through democratic means- We are still waiting yet, for how long and how much more detrimental processes will we continue to directly and indirectly participate in before we wake up? The reality is that we are causing all of this water pollution and business-making schemes due to the accepted and allowed separation that we have created toward all of the Earth’s resources, the animal kingdom and ourselves and neglecting the fact that we are in fact equal and one as the living substance that we are all made of. We as human beings should have been the ones that guarded our best interest in equality as life; instead we have turned life into a business making machine where we all want to be winners without realizing that entails creating losers – we are no all facing the consequences of allowing this at all the levels that we have reviewed here thus far. We caused the problems, we must create the solutions. Water: ¿Human Right or Asset? 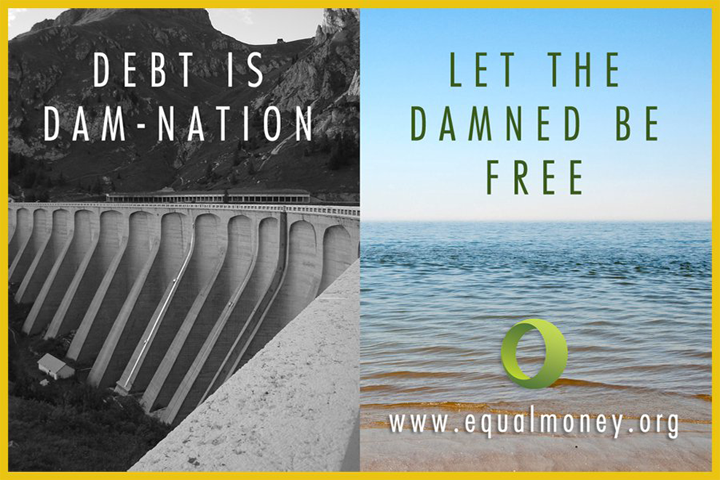 The Vital element for Life – which is Water – Must be a Universal Human Right and a common good; this means that money won’t determine your access to it, nor will it be able to be turned into a profitable business within the Equal Money System that will be implemented according to the Fundamental Human Rights as proposed by the Equal Life Foundation where every human being will be entitled to equal rights to the necessary means to live in dignity as that is what is best for all. This can also be acknowledged in a United Nations Convention where it is declared that Water is a Human Right, however as we know rights are not enforced and actually implemented by all nations. Therefore, it must be part of the Global Trust that we can create where no particular nation has control over it other than for equal distribution and management purposes at a local level. No particular administration will be able to influence that which is declared to be a patrimony of every individual who will be entitled to the use and consumption of water in a self-responsible manner, which means proper education and new ways of usage can be implemented to ensure the efficiency in the use of it. We have to conduct governmental changes that can put a definitive stop to this abuse stemming from privatization carried out by corporations in conjunction with politicians/ governmental authorities. Our participation through direct democratic process to enter the political arena is a necessary step to ensure we, the people, get to settle an agreement where Water becomes a Human Right and as such managed by the Equality Based Governance where it is understood that each one of us will monitor and ensure that the distribution and use of water is conducted in a best for all methodology. It’s already proven that unity, organization and a common effort is the way forward to change our acceptance and allowance of this profitable business that we have turned water into – instead we implement and establish Equal Access to Water within the framework of Basic Fundamental Human Rights and the Equal Money System and Equal Money Capitalism. Having or lacking money won’t determine whether you benefit from it or not. This requires necessary changes in all our current living habits beginning with agricultural and industrial practices to ensure that the production processes are not polluting our water, air/ environment since it is the vital cycle of water that must be taken care of and restored to a process where we can obtain the necessary water by respecting the time necessary for it to filter and then be ready for our use and consumption again. Recycling water is an option, but investing in further research on how to obtain water through for example, condensation processes is another option as well as funding any necessary scientific projects to purify water once that there will be no corporate interest tampering this emerging technology to do so. It is in our best interest to maximize natural resources’ efficiency, reestablishing and correcting the filtration process of the water in the same soil and territory where it will be used– meaning that we have to ensure we stop transportation of water to maintain central cities that are taking up the most resources from distant places, causing already severe damages to the ecosystems that are having their water being siphoned. This means becoming aware of the destabilization that ensues when we try and ‘give water’ to places where there is non to maintain cities were life is not made sustainable yet. We all have to become aware of the habits with regards to water usage, but also understanding the necessary changes in assessing what we need and how we produce it, so that all processes are aligned to resource efficiency along with the necessary water treatment plans to ensure that all necessary preventive measures are established; money won’t be a limitation to not do this and science will be encouraged to find new materials, new means and methods to produce what we require to live. Local agriculture in terms of the Food System will enable a region’s water resources to support the local Food Production; this means ensuring that the water are feeding and sustaining the locality instead of being siphoned in exports, disrupting not only the local economy but also the natural cycles of water. Another measure is stopping the creation of dams and instead create alternative ways to retain rain water to enable the hydrologic cycle to re-establish itself to ensure that the filtration of water through the soil is adequate. Another measure can be limiting housing in particular areas where the amount of water is compromised or non existent – this will ensure stopping creating unnecessary infrastructure just to please the interests of a minority that are currently possible due to the power that money has. This entails the necessary educational processes in terms of population, buying habits, and use of water in a responsible way, as the vital element to life that it is and must be available for all equally. Reform at a Constitutional Level and make the necessary reforms and amendments will make of Water a Fundamental Human Right where Waters are protected from any organization or institution that may want to abuse it for other purposes other than supporting life as what’s best for all. Corporations won’t exist as profit-making machines, but actual producers of goods that can go re-forming their production processes to be genuinely environmental friendly and quality producers. Water is the key element to live, thus it is in our best collective interest to ensure everyone benefits from water and learns how use it in the most efficient way. 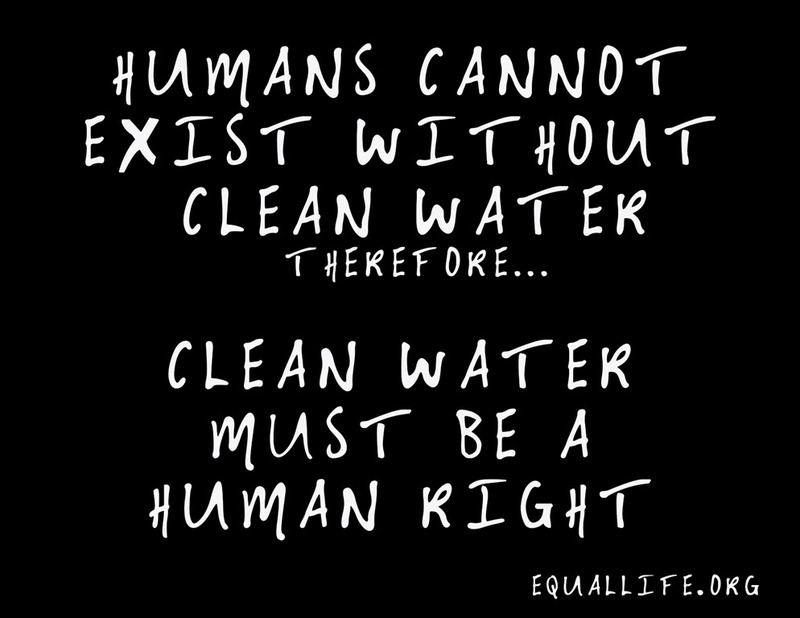 The Fourth Fundamental Human Right is a Fundamental Right as well, because the Human cannot Exist without Clean Water. Thus, Water (also freely Provided by the Earth – except for the part of Purifying it, which is the Human Labour part) – is a Fundamental Human Right that is Not Possible to be Negotiated, Sold or in any other way Used to Diminish Another Human Being. To Do such things is In Fact Human Rights Violations and a Crime. Ensuring the quality of our water by our own ability to monitor, manage and ensure the quality and access/distribution of water takes place in a best for all manner is what will enable all of us to stop the current deaths, diseases, birth defects and general water degradation by virtue of our individual cooperation and participation to observe and participate in the managerial processes where we can assure that our well being is in fact taken care of by those that decide to work to manage this collective resource. No more privatization, no more wars, no more points of control , no more pollution or abuse from corporations dominating this vital resources. Instead all corporations or organizations that decide to work with water will be for the purpose of ensuring the best administration of water, treatment plans and any other emerging technology that will enable us to purify water and make it available for more people until everyone is covered. This won’t be a business, but a decision to do what is Best for All since that is also implying our own well being is secured and guaranteed such as having sufficient water for everyone to live. This entry was posted on Saturday, April 27th, 2013 at 11:58 pm	and tagged with article 31, blue gold, bottled, bottled water, coca cola, constitutional reform for water, global trust, nestle, reform the monetary system., solution to the water problem, trapped, UN declaration of human rights, water, water is a human right, water is an inalienable right, water pollution, water reform, water wars and posted in Basic Human Rights, Bernard Poolman, capitalism, change the system, consciousness, Constitutional Equality, control, Corporate Capitalism, corporation, correction, Democracy, Desteni, disease, dishonesty, documentary, education, efficiency, EMC, enslavement, Equal Life Foundation, Equal Money Capitalism, equal money system, Equal Rights = Equal Responsibilities, Equality, equality consideration, equalmoney system, Evil, Global movement, globalization, government, greed, humanitarianism, Integrity, International Organizations, Journey To Life, Life, Life in Equality, mind control, Monetary Policy, Money Limitation, Nature, Neo Corporate Colonialism, Neo-Colonialism, New Economy, OWS, political economy, Private Property, sacred economics, self interest, social awareness, social conditioning, Social Reforms, socialism, suffering, survivalism, system, System Reform, system savvy, Trade, water, world equality, world s ystem, world values. You can follow any responses to this entry through the RSS 2.0 feed.